The phrase goes; ‘Make hay while the sun shines’ or something like that anyway! I can confirm it is definitely not; ‘ Make jam while the sun shines’. It is hot and sticky – literally, and when it goes wrong it’s effing annoying! I got home after a fab bank holiday weekend full of la joie de vivre ready and raring to get to work in the kitchen on strawberry jam! 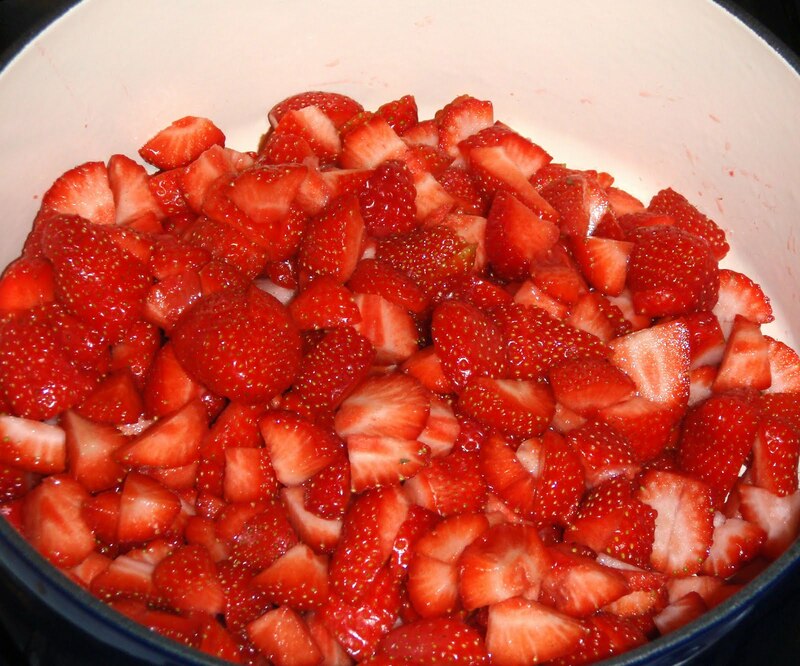 Hull and halve the Strawberries, then plonk them into a heavy bottomed saucepan (I used my Le Cruset coquette). 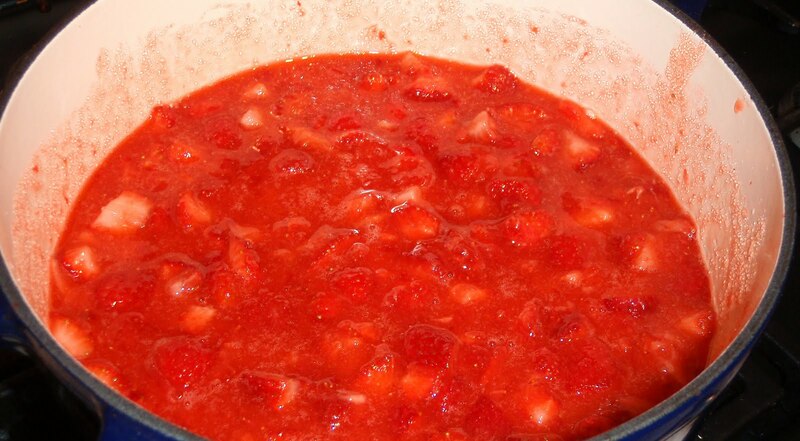 Then with a potato masher squidge the strawberries until they are half and half mush to strawberry halves. Put onto the hob on a medium heat and bring to the boil. Simmer for 5 – 8 minutes. This really is all it needs and not the 25 minutes i boiled it for! Skim off any white foam from the top and leave to cool for a little while. Pour into jam jars, put a wax circle between the jam and the lid and label. It’s best to keep this in the fridge, there aren’t too many jars that will take up too much space. And there we have my jam! 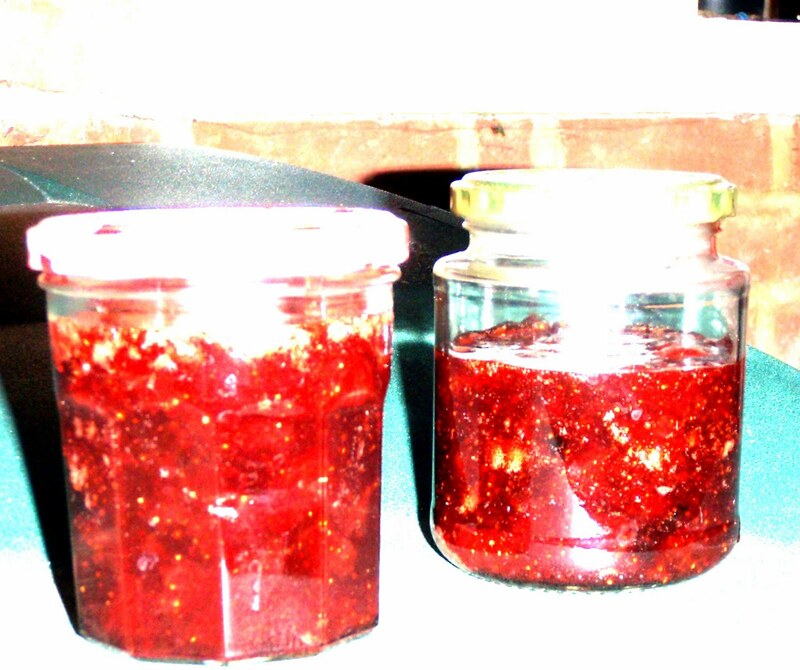 There is a reason for the massively overexposed picture – it’s so it doesn’t show the black bits in the jar. I sterilised 5 jars and got 2, not even 2 but one and a half jars of slightly bitter Strawberry Jam!!! !